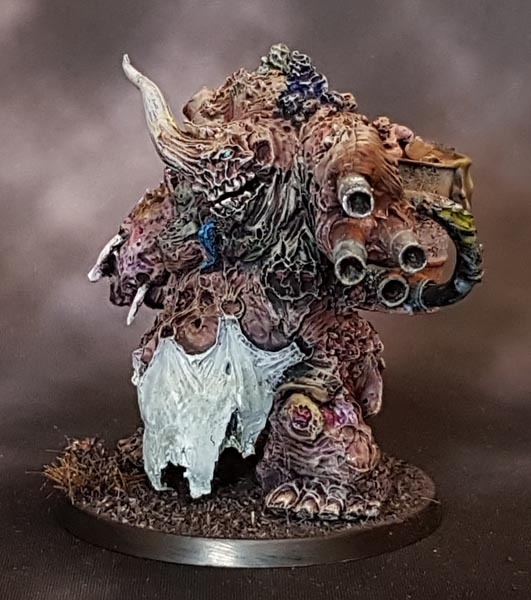 Forge World’s Daemon Prince of Nurgle! I like this one so much better than the GW space marine daemon prince mini. 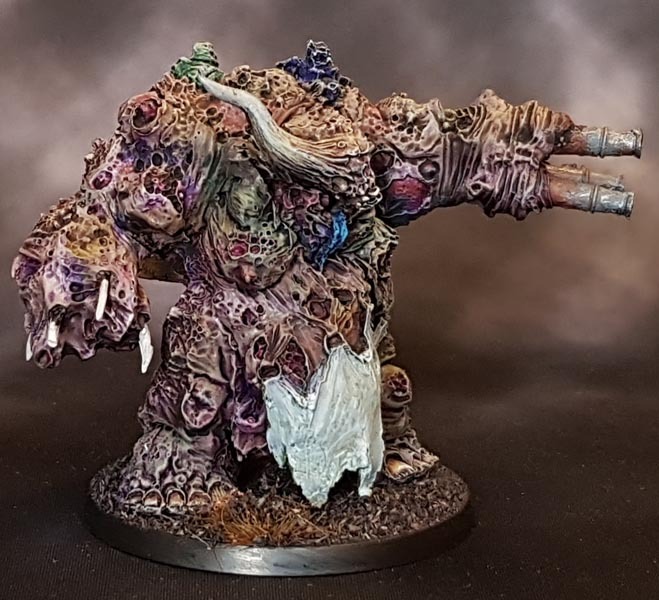 I bought this second hand some time ago, and now that I have looked at the forgeworld site to see what the name of this mini actually is (turns out it is “Daemon Prince of Nurgle”. For some reason I thought it was a named character.) I see that I am missing a second hose part between the barrel and the weapon arm. Oh well. I won’t be bothering with that bit then now that it is painted, after all it is not as if I missed it neither when building nor painting. I painted it as follows: First an airbrushed black undercoat followed by a light grey zenithal. On top of this I sprayed some thin leathery brown and bone-ish colour (don’t remember exactly which ones, they are Vallejo model or game Air at any rate. I did this some time ago). At any rate, critical mass was achieved and I decided to finish it. 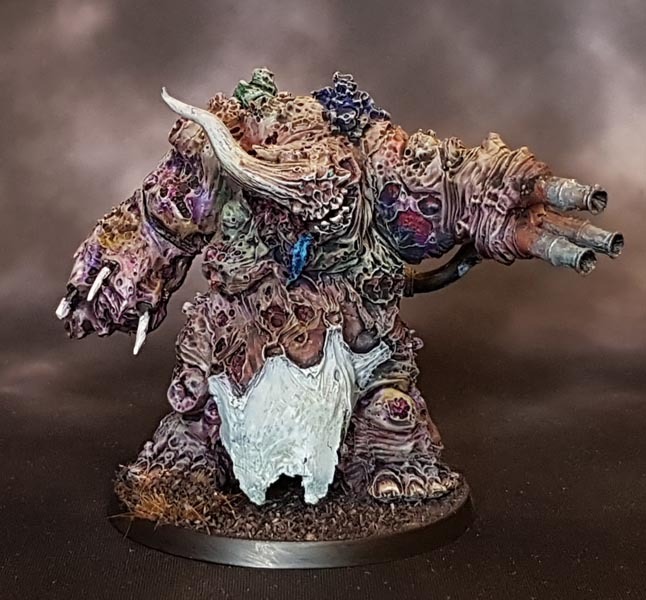 After making sure that everything that needed colour had some, I gave it a heavy wash of Citadel Druchii Violet Wash, together with Athonian Camoshade and some dabbings of Carroburg Crimson and Coelia Greenshade washes here and there. All applied while the previous wash was still wet. Knocking back the resulting purple by carefully drybrushing with several fleshtones, the gun-barrels and the barrel-barrel were done in Scale 75 Black Metal, followed by heavy rusting and weathering with oranges and light turquoise. The unwashed (greatly unclean!) 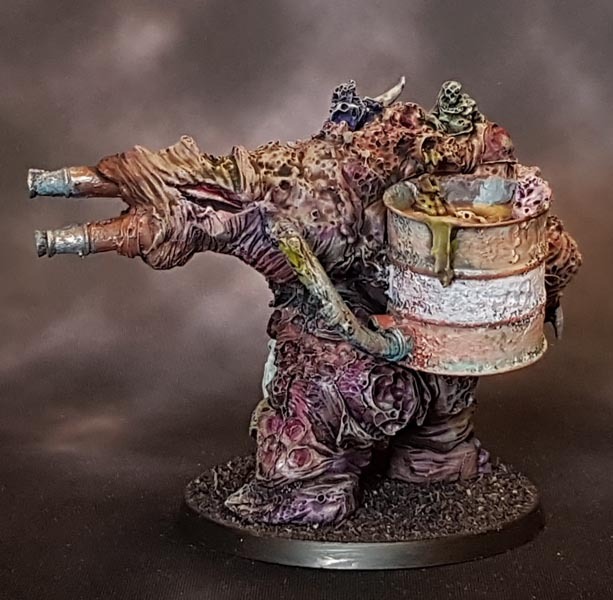 apron was touched up with some light grey, Teeth and nails in bone-tones and the barrel was finished with some Battlefront Sicily Yellow and some Pale Flesh for that Fallout radiotoxic barrel-feel. I did the base in black flock, using a dark brown bushtuft with black flock glued on to represent the aura of decay surrounding the Prince killing off the vegetation around him. 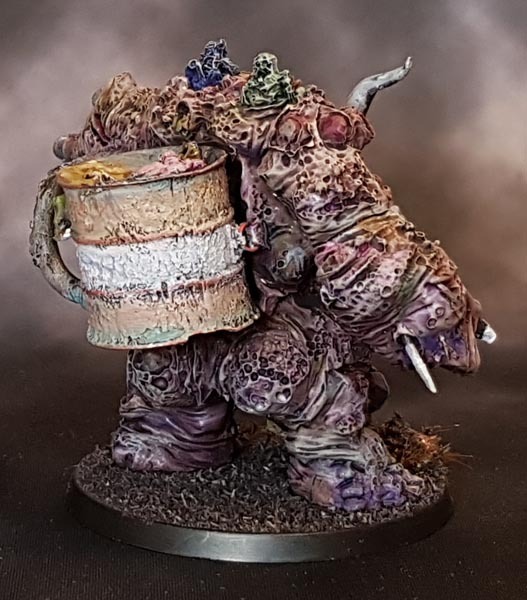 And that ‘lil nurgling taking a bath in the barrel is just so cute! Very nice work here. I painted the same figure earlier this year – his “Daemon name” is Mamon Transfigured, Fel Icon of the Tainted. You’ve done a great job on the greyed, decayed flesh here. Quite disgusting!